A new week, with new achievements and new possibilities! tough in the school including the following week that's why I spended my weekend at the castle and didn't go out for something perhaps funnier and more attractive! 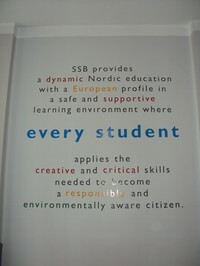 - Views from the inside of the Scandinavian School of Brussels. we had handball at sports, both French and Finnish teachers were sick but our good English teacher was present and we discussed the last questions about "THINGS FALL APART". This book is about the great warrior Okonkwo from West Africa who is the leader of the powerful tribe from Umuofia. I don't like to read books but when you are more or less forced to it and give the book that time it needs it actually is quite interesting and sometimes even more interesting! This book Things Fall Apart which is a bestseller and quite famous as the Alchemist gets 4/5 points. 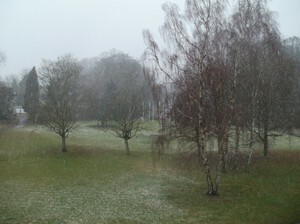 - View from window. Pretty bad weather today you see! 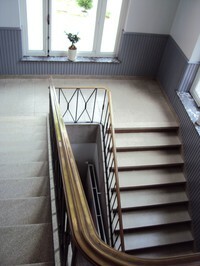 and more and more is clearing up, tomorrow I'm going to visit the "AUTO-ECOLE EUROPEENNE". And discuss about the driving exam, if I need an interpreter from French into English, and when I have the access to start driving! the SSBMUN group will present the whole SSBMUN for each GYM class at the tutor lessons. Be aware of a piece of information. 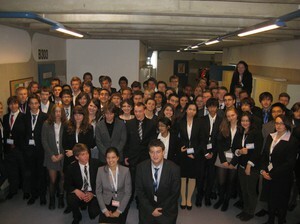 - Picture of the Disarmament Committee, my committee the best one, I really enjoyed it! Thanks all that made it so funny and good and the atmosphere was amazing in Germany, Berlin. I miss it. Do you? is a "Korfbaal" tournament waiting and SSB has a team for students. It's quite the same as basketball but less tackles and you are not either score the same way because you can move yourself in a radie of 360 degrees around the score point. LOOK HERE ALL FINNISH SWEDISH SPEAKING STUDENTS! DURING THIS WEEK A MAGAZINE FOR STUDENTS CALLED "KOMPIS" WILL BE RELEASED IN WHOLE FINLAND FOR ALL STUDENTS IN CLASS 9! BECAUSE I WAS ASKED TO DO AN INTERVIEW FOR A MONTH AGO FOR THIS COMPANY! KEEP YOUR BIG EYES OPEN FOR ME STUDENTS IN CLASS 9! Have a good evening and a good week of studies or a great working week!